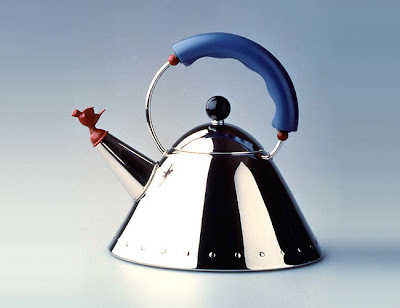 This is Michael Graves' 9093 Kettle (the big one) and this is what we're giving away. Michael Graves' New Americana collection for Alessi from 1985 grew out of his dissatisfaction with Modernist expression. In a series of experiments to help him find a newer design vocabulary, he turned a Postmodernist eye to every day objects. His New Americana collection was an over night sensation and it brought the work of an already-famous architect and product designer into the homes of people worldwide. Graves' pairing his iconographic sensibilities with Alessi is a perfect match. Alessi's entire raison d’être is to re-imagine every day objects. Graves' career is marked by his embrace of a studied whimsy and I love him for it. That same studied whimsy is at the root of my passion for all things Alessi too. I'm pretty thrilled to have the chance to bring some of the serious fun into someone else's life through this give away. All Modern carries most of Alessi's collections by the way, so give them a look-see. Alessi proves that Modern design can be both a serious art form and a whole lot of fun. So it's pretty simple. All you need to do is leave a comment after this post and I'll draw a winner at random next Sunday, 14 June. There aren't any magic words to repeat or assignments to complete for this one. All I'm looking for is a comment. Good luck! Yay! I want one! Love All Modern. me! me! pick me! I want to make a hat out of it! Lovely! My teapot is so old and sad! Oh no you brought tears to my eyes. Use to have one but it burnt. Promise to look after this one! Me too. I don't even have one. What a great giveaway. Good luck to all those entering. That teapot would look great in my post modern kitchen- it's meant to be! I saw that tea kettle in person this weekend at my co-worker Jimmy's house. It is really a work of art. I love the bird!! What a great kettle! Hmmm I have a chick flying the nest soon - perhaps she can take the old one when Mums wins this one!!! Finaly, one of your adds disaproves of my computer (or vise-versa). Anyways, my tired old flame colored Le Creuset tea pot has seen much better days (like the 90's), and now that I have almost kicked my coffee habit I believe a new tea pot is in order. Great kettle!! Would love to win it! Thanks for the contest - please enter me. I drink a lot of tea! I just love the Alessi line.. I have a few of their things and I absolutely treasure them. I have to check out the All modern site..
Kathy Shaffer now loves Michael Graves since Paul so kindly and gently told her that one of his lovely buildings is about 3 or 4 blocks from her house. You must come and see it when you are in Lititz next. Also, you are always welcome in our home, but be forewarned, I need at least a week to clean up for guests. Sometimes more! If I am super lucky, we can heat up some water for a nice pot of tea in Mr. Graves' beautiful Alessi kettle.